It's a fact that Filipinos love rice. We eat it 3 times a day and for many of us, one cup simply isn’t enough. According to the Philippine Rice Research Institute (PhilRice), the average Filipino consumes 3 cups of rice per meal, which means 9 cups of rice a day. However, for an agricultural country, the Philippines has had to import rice to feed its people. In fact, in 2010, the Philippines was the biggest importer of rice in the world. The production of rice simply cannot keep up with the demand. Data from PhilRice also show that in 2010, Filipino farmers had to produce 286.2 million cavans of rice to feed 92.34 million Filipinos. This rice shortage poses a problem for a country where 25.3% of its population is living below income of $2 a day and relying on rice to fill their empty stomachs. However, organic brown rice might be a game changer and could contribute to solving the rice shortage in the country. While brown rice is known for its health benefits, given its high fiber content, brown rice also reduces rice wastage and therefore helps boost rice self-sufficiency and food security in the Philippines. According to Professor Ted Mendoza, a crop scientist from the University of the Philippines Los Baños, milling white rice removes 38% of the husk compared to milling brown rice which only removes 28%. Brown rice has a 10% higher milling recovery. Oxfam International said that this 10% higher milling rate translates to almost 1 million tons of milled rice, which is almost the same amount of rice imported by the Philippines. But not only is brown rice going to help the country become more rice self-sufficient, brown rice also helps small-scale farmers adapt to climate change. By saving on production and labor, farmers will have the chance to diversify their crops, helping them adapt to the changing climate. The government has, in fact, seen the importance of brown rice. 2013 was declared the National Year of the Rice. 2012 and 2013 also saw the launch of The Good Food Project led by Oxfam International and Dakila. Both campaigns promoted brown rice and encouraged more Filipinos to bring brown rice back to their tables. Today, the government continues the promotion of food security through the “Be Riceponsible” campaign. One success of the campaigns was a resolution by the government of Quezon City “enjoining the observance of organic unpolished brown rice consumption" every Tuesday. The resolution encouraged the consumption of unpolished brown rice at the Quezon City Hall Complex, Novaliches District Center, and all city public schools and hospitals and barangays. Historically, pre-colonial Filipinos ate brown rice, locally called “pinawa.” It was only when milling machines from the West were introduced in Asia that Filipinos shifted to white rice. But seeing the problems we are now facing in food security aggravated by the impact of climate change, this might be the right time to rethink the way we produce and consume rice and instead revert to brown rice. The difficulty, however, remains to be that organic brown rice, at around P50-P60 (around $1.25)* per kilo is a lot more expensive than white rice, the cheapest being NFA rice at around P32 ($.75) per kilo. The high cost of organic brown rice makes it difficult for the average Filipino to consume brown rice. However, the fact is, with lower labor and production cost, brown rice should cost less than white rice but because demand is also low, the price has become high. A bigger demand, then, is needed to lower the cost of brown rice and make it accessible to more people. This is where local government resolutions and ordinances such as that of Quezon City becomes important. By giving Filipinos more access to brown rice in the market and by allowing it to become an option in restaurants, brown rice might just get the attention it needs. 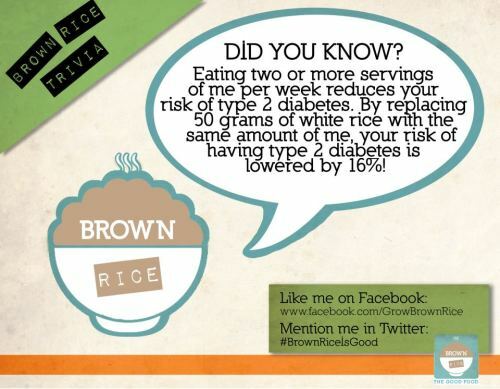 While it may be difficult for the average Filipino earning a minimum wage to eat brown rice 3 times a day, eating brown rice at least once a month can already make a big impact. According to the Department of Agriculture, if all Filipinos ate brown rice for breakfast, lunch, and dinner at least once a month, the country’s importation of rice will shrink at an average of 500,000 metric tons/year. Shifting to brown rice is also a challenge for a country with a sweet tooth. Brown rice tastes different and may be quite difficult to pair with our favorite sinigang, kare-kare, or adobo. But it only takes creativity in the kitchen and some getting used to. In a country vulnerable to climate change and its impact, brown rice will help us face the threat of food insecurity. People are starting to shift to the better rice, although gradually. Let us all be a part of this shift. Let's give brown rice a chance to be a part of our meals and help our country better adapt to the impact of climate change. Where can we buy your brown rice here in las pinas alabang area?